19 Nov 2018 - Elliott Brown Did you know? 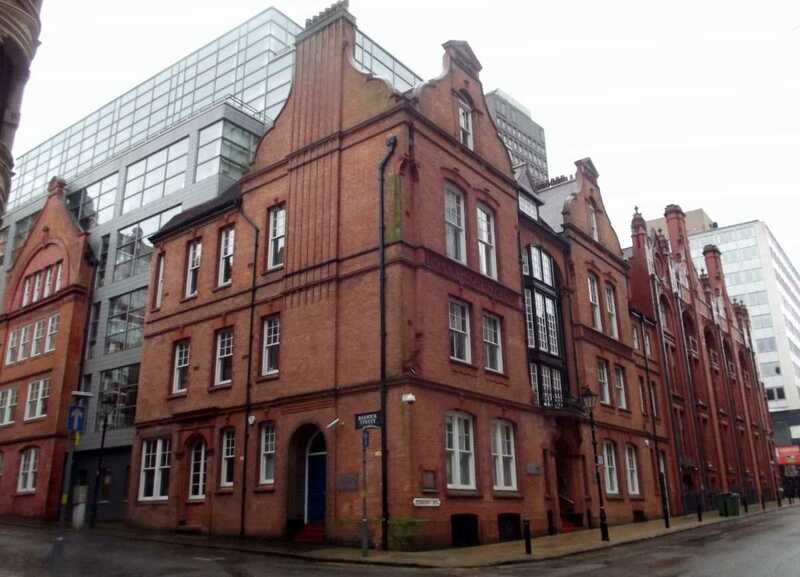 There might be new buildings going up in the Colmore Business District, but there are examples of red brick / terracotta / stone buildings still there from the Victorian period. Some are just facades with a modern building behind. Architects such as J. H. Chamberlain, William Martin & Frederick Martin left there mark in the area. Most examples from the late 19th century. This public house is Grade II listed and dates to the late 19th century (around 1898). It's at 53 - 55 Church Street. Was a rebuilding of a previous pub on the same site called the Red Lion for Alfred Homer, by the architect A H Hamblin. Purple brick and terracotta in a vaguely Loire style. During the football World Cup or the Euros, they put bunting flags up of the countries that were playing at the tournament such as below in July 2018. This building is a bit hidden at the moment. Heading up New Market Street from Great Charles Street Queensway you find this building on the corner of Cornwall Street. A Victorian red brick and terracotta building. It is not listed. Purnell's one of Birmingham's Michelin starred restaurants is located here. There is hoardings on the building to the left, blocking off half Cornwall Street and half of New Market Street for something called The Lightwell. Back to 55 Cornwall Street, it has four storeys plus an attic level in the roof. This building is Grade II listed and dates to the late 19th century. You would find it opposite a bus stop and to the right of the Birmingham School of Art. Edmund Street used to continue beyond Margaret Street, but that's part of Chamberlain Square now (between the Council House and Council House extension). The building is of red brick and terracotta, with Corinthian style columns. The building is in a derelict state at the moment, and has a Danger sign on the door. Hopefully it could get restored and given a new use, such as a restaurant or bar? This building is a red Victorian Gothic structure by the architects Chamberlain and Martin. Started in 1884 and completed after the death of J. H. Chamberlain in 1885 by his partner William Martin and his son Frederick Martin. Their architect firm completed an extension down Cornwall Street in 1892 - 1893. Associated Architects refurbished it between 1992 and 1996. A Grade I listed building, at the time of it's listing in 1970, it was listed as Art And Design Annexe, Birmingham Polytechnic. It is now listed as School of Art, Birmingham City University. The College of Art used to be part of the former Birmingham Polytechnic, which became a University in 1992 as the University of Central England. It was rebranded as Birmingham City University in 2005. It is now part of BCU's Birmingham Institute of Art and Design. And to this day it remains part of the University's Department of Fine Art, but is commonly referred to it's original title. A Grade II* listed building dating to 1889 (or 1899) by the architects Jethro Cossins, F. B. Peacock, and Ernest Bewly. Originally the Birmingham Library, which from 1797 until 1899 had premises on Union Street before they moved to the site at the corner of Margaret Street and Cornwall Street. This library was established in 1779. It was a private library. 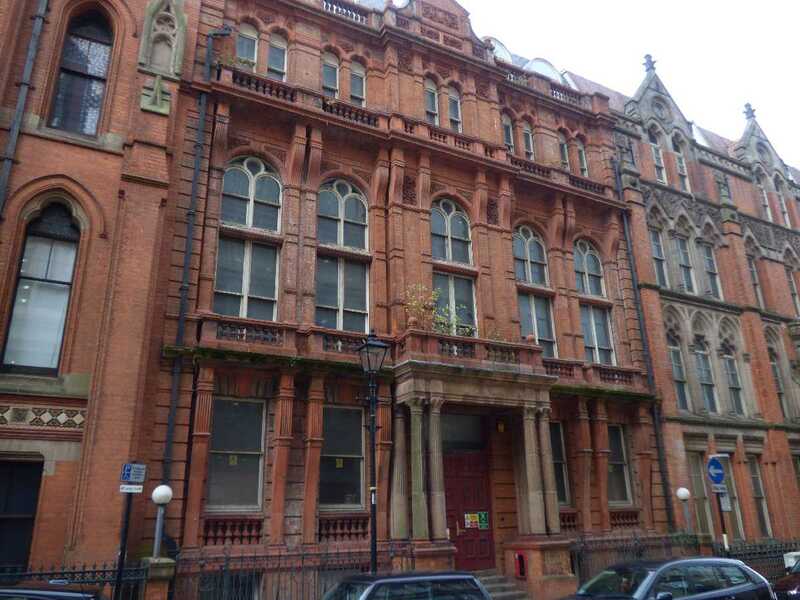 The Birmingham and Midland Institute moved into this building in 1965 after their previous 19th century building was demolished, and they remain here to this day. The BMI was the pioneer of adult scientific and technical institution (General Industrial, Commercial and Music) and it today offers Arts and Sciences lectures. The Cornwall Buildings at 43 - 51 Newhall Street. It is on the corner with Cornwall Street and is Grade II listed. Built in the late 19th century is is built of brick and terracotta an has a slate roof. It was originally built for the Birmingham Hospital Saturday Fund (a low-cost medical insurance society). All Bar One is a chain bar, serving beers, wines and cocktails. The BT Tower is seen to the left in the Jewellery Quarter. This is The Scottish Mutual Assurance Society Building, built in 1895. On the corner of Edmund Street and Newhall Street. 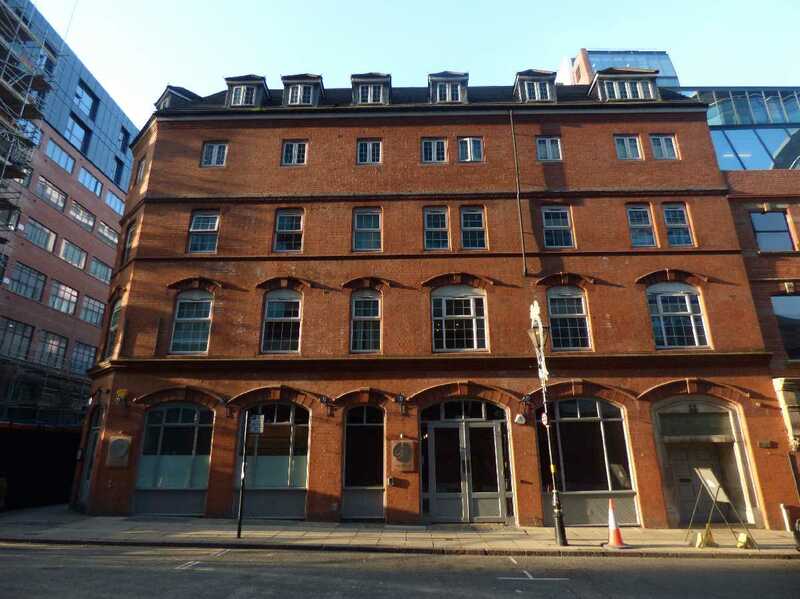 Located at 29 Newhall Street and 106 to 110 Edmund Street. Used to be a pub here called The Hogshead. It's a Grade II listed building. It was by the architect Frank Barlow Osborn for W M Smythe, and was originally Solicitors' offices with sets of doctors' consulting rooms on either side. Red brick with ashlar sandstone dressings; blue tile roof. The building is asymmetrical and was built in the simplified Flemish Revival style. Edmunds Bar & Brewhouse has recently closed down. On the corner of Church Street and Edmund Street was the Birmingham and Midland Eye Hospital. This building was built in 1883, although the Eye Hospital was founded back in 1823. Founded by Joseph Hodgson, Eye Surgeon at The Eye Institution, Cannon Street (opening in 1824). It later moved to Steelhouse Lane (1853) then later to Temple Row (1862). They moved to Church Street in 1884. They were relocated again in 1996 when the Eye Hospital moved to City Hospital on the Dudley Road. The building was designed in the Franco-Italian style. A new wing was added to the hospital in 1895. 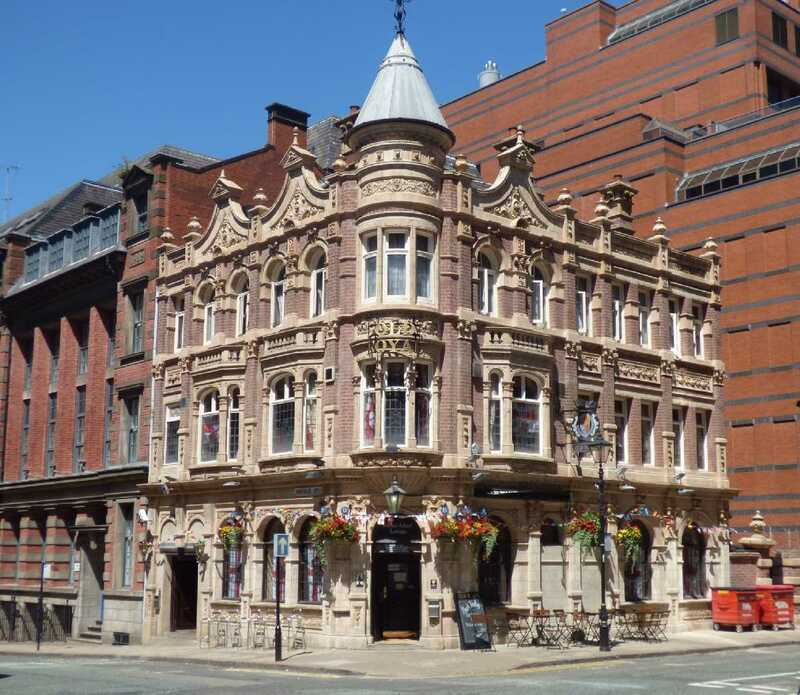 The architects was Payne and Talbot and the building was built in 1882 to 1883 in the modified Queen Anne style, of dark red brick with light-coloured stone dressings. Hotel Du Vin is a luxury hotel at 25 Church Street, stretching from Edmund Street to Barwick Street. Wards, operating theatres and laboratories have been converted into bedrooms, dining rooms and meeting rooms! At 105 and 107 Edmund Street is this Grade II listed building, at the corner with Barwick Street. Originally built as The Birmingham and Midland Ear, Nose and Throat Hospital in 1890 to 1891 by the architect Jethro A Cossins and Peacock. In red brick and terracotta with a tile roof. On Barwick Street is at no 70 to 78. Now the offices of H B J Gateley Wareing Llp at 111 Edmund Street. Some sections on Barwick Street have modern inserts in-between the original Victorian architecture, a bit of an old and new mishmash! The foundation stone of the Ear & Throat Hospital was laid by the Marquess of Hertford in 1890. This building was formerly the White Swan pub of around 1890 by the architect J.S. Davis, it was facaded in the 1990s. 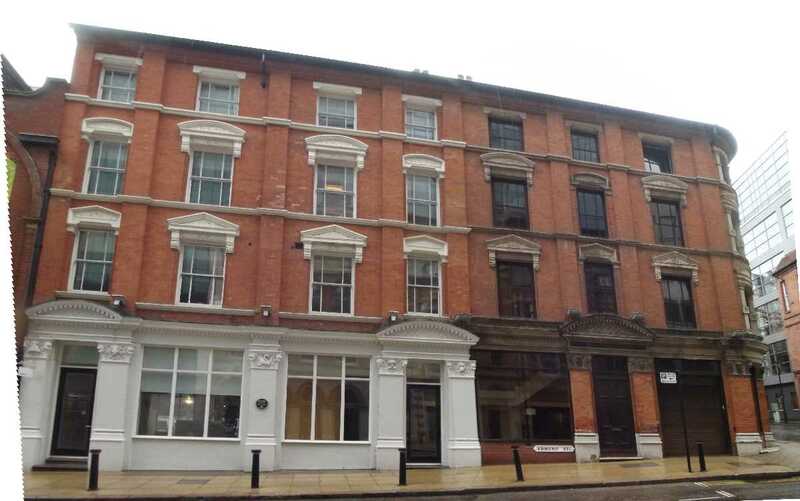 Located at 117 to 119 Edmund Street to the corner with Barwick Street. Hortons Estates owns the building, and Maddox House to the left was named after Conroy Ronald Maddox (1912 - 2005), a surrealist artist and Birmingham innovator. You would find a black plaque on the front of this building. My photo below was taken in 2013. Enterprise House has since been refurbished since around 2014 and that's at 115 Edmund Street. Now offices.